Ever since the tennis in Wii Sports stole our hearts, entered our minds and (sometimes literally) TV screens, the virtual representation of the sport has taken on a new lease of life in the home. Sure, Top Spin and Virtua Tennis have scratched that realism itch on other systems (as well as Rockstar's Table Tennis on the Wii), but Mario and chums (along with the Wii's packed in mega hit) gave it a light-hearted shot in the arm. Unfortunately, Mario's last outing on the Wii U was a disappointment, with a double fault of limited content and features being cited as the main issues. Enter prolific Finnish developer 10tons, which has already brought over a number of arcade twin-stick shooters - such as Neon Chrome and Crimsonland, among others - to the Switch. Don't be fooled, though, this isn't another sports fix for the Switch. Tennis In The Face starts with a brief introduction to our illustrious protagonist presented as a series of newspaper front pages, chronicling his fall from grace as a world tennis champion to pre-school coach after becoming addicted to an energy drink, called 'Explodz'. Our hero is recruited to save the similarly intoxicated city from the drink's evil manufacturer and end their reign of chaos. Once the narrative exposition is over, the realisation as to what kind of game it actually is may come as something of a surprise. Mechanically it takes a lot of cues from contemporary and cultural phenomenon Angry Birds - moving either your finger or the left stick, you can adjust either a straight line (when it's your trusty tennis ball) or an arc when you are given a bit more firepower. You have a specific number of projectiles with which to dispose of various enemies in order to progress around the grid-like metro map, similar to 10tons' object flinging puzzler King Oddball. 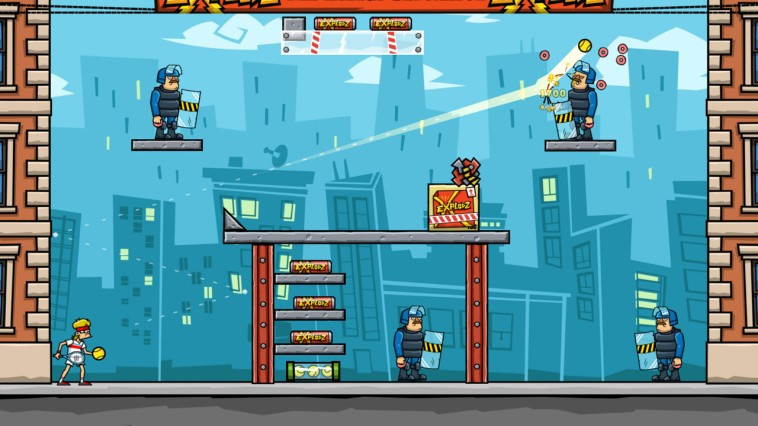 Completing levels will unlock bonus challenges, new weapons and enemy types; with online leaderboards in addition to 100 regular and a few dozen bonus levels, there's enough content and variety here to fill a decent number of commutes. It won't win any originality grand slams, but despite its familiar set up there is something immensely satisfying about a tennis ball walloping a smug looking hipster in the face in slow motion, as the perfect cherry on a simultaneously level clearing cake. 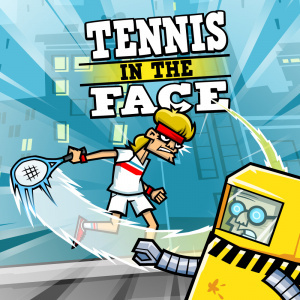 With tubes of extra balls flying with a well placed shot, along with explosives and boxes of shrapnel to utilise to dispatch any number of foes, Tennis in the Face is in fact a very literal title, but it's also fun; that's the important thing. It is easy to get a kick out of seeing a group of riot police or clowns scatter across the screen like bowling pins, or unnervingly fragile architecture reduced to dust. 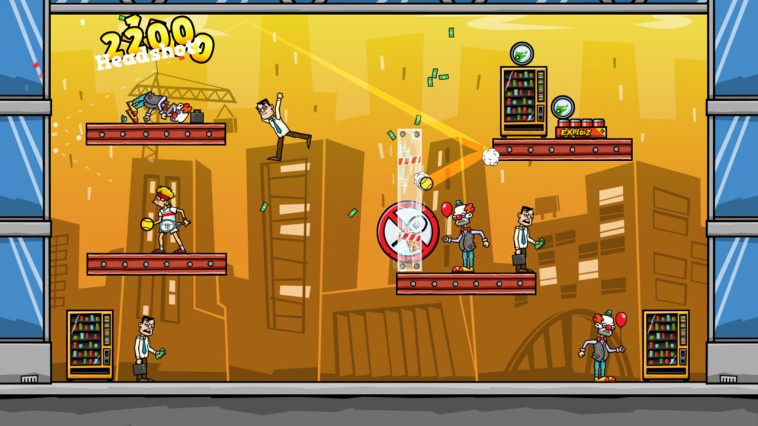 There are extra points for completing a level with projectiles to spare, as well as multipliers and head shot bonuses to increase your score. Its mullet sporting and disgruntled main character, bold cartoon visuals and funky bass synth soundtrack are comparable to a Saturday morning cartoon. With every new item introduced, too, there's more potential for increasingly bonkers, Rube Goldberg machine-like set pieces, and every failed attempt is a useful learning experience as a result. The trajectory of your previous attempt is also shown - which is handy - and with objects reacting to contact in real time there's a pinball-like and pleasing unpredictability to it. 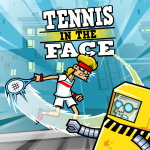 Tennis In The Face works better than some of its rivals for a couple of reasons. Its tongue in cheek and self-referential humour strikes a chord whether you are familiar with the intricacies of the sport or its key figures, or if you just enjoy the slapstick wackiness of it all. Furthermore, the physics engine is not only nicely layered and dynamic, but because the levels are enclosed it makes the game continually more satisfying - you see objects ricocheting off each other long after you've fired your shot. A dozen or so balls causing absolute carnage in any given stage brings back fond memories of power-ups in brick-busting retro classics such as Arkanoid or Alleyway. Those waiting for a an actual tennis game will not find an interim solution here. Despite tennis being 'in the face' regarding its presentation here, it's another single screen, physics-based puzzle destroyathon. It is also, however, vibrant, fun, funny and chaotic. 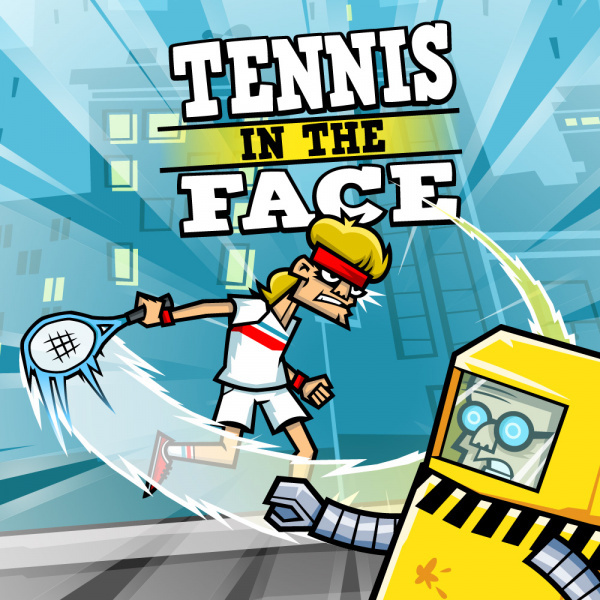 The main character is a likeable amalgamation of both tropes and celebrities from the sport, and while the mechanics are pretty well worn in by now - especially in the mobile space - Tennis In The Face is probably among the top seeds in its genre on Switch. If you are over this kind of game it won't change your mind, but it's a well presented and addictive slice of structure (and tie) breaking action. I believe this would be the 300th game on NA's Switch eShop. this looks like a bland mobile game. So many other games could use a review before this. @masterLEON that’s insane for a system not even a year old. But as the reviewer said, I am done with this style game. Since the babomb shooting game back on the ds mario 64 port, I’ve been done with this genre. Eh, I'll buy it at that price. Looks pretty intriguing. I still yearn for a true sequel to Mario Power Tennis from Game Cube. Open wasn't bad, but coming off of Power Tennis, it was a super disappointment. Ultra Smash and Sports Superstars are better off forgotten. I have a soft spot for physics based games, so I might actually check this one out. Many thanks for the review. This gets a 7 and LA Noir gets a 7. Differences aside that LA Noir at 7 doesn't seem right. It's like giving a 7 to a nice decorated one room appartment and a 7 to the Greek Parthenon. 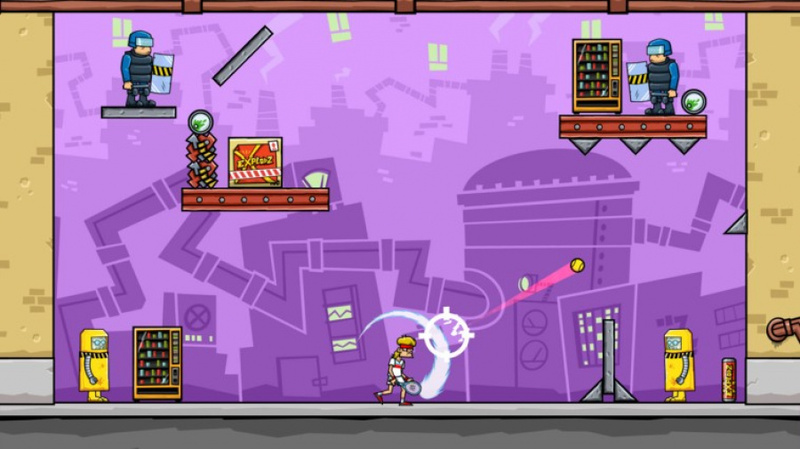 @StephenYap3 I've really enjoyed Ultra Smash, though its main course is of course the multiplayer since there is no single player content which made it the worst tennis Nintendo game in existence. Top notch gameplay though. @Megal0maniac I have no problem with amazing Tennis gameplay as long as there's good content to go along with it. The problem with Ultra Smash, in my opinion, is that while it does great in the gameplay department, the sheer lack of content is what killed it for me. Part of what made the Mario Tennis series (as well as any Mario Sports game) is the content, ranging between plenty of themed courts, mini games, characters, and plenty more. Ultra Smash and Sports Superstars (even) had neither of that and the fact that there are no Mario-themed environments or gameplay elements further bruises the already-bruised area. I mean, if I can't have actual content to go along with the good gameplay, then what's the point of me continuing to play it?